I’m back from an inspirational few days at the IATEFL Conference in Birmingham and ready to report on my own workshop ‘The Gap between Classroom and Online Learning – Closing the Circle’ which took place on Saturday, the final day. Vanpatten says that without a valid definition of communication we can’t understand what communication is. His preferred definition is ‘communication is the expression, interpretation, and negotiation of meaning in a given context.’ What I took away from that podcast was that not all pairwork is necessarily communicative, and communicative tasks should always have a purpose. This led me to analyse what I was doing with authentic materials in class and I realised that I was relying heavily on comprehension questions or tasks that involved students sharing their opinions, but not a lot else. 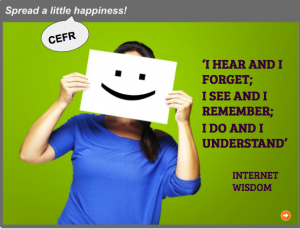 So I turned to the CEFR, or rather returned, as we have an on-again, off-again love affair. From giving training courses on the CEFR, I know that many teachers are not really familiar with the descriptors. They may know the global scale or the self-assessment grid, but not much else. So my goal was to get people thinking about how they could take advantage of the CEFR to create their own lessons, particularly tasks built around online materials. I used modules from telc’s English Practice Material Online B1-B2 to create a variety of communicative tasks. When it comes to using blended learning or self-study materials as homework, many teachers worry that students won’t actually do the activities. If this happens, it can be very de-motivating and can disrupt the entire lesson plan. If it happens a few times, the teacher might soon decide that the ‘tech’ experiment just isn’t worth the effort. To ensure that students carry out the online work we set them, we need to create a stronger link between online activities and the classroom. 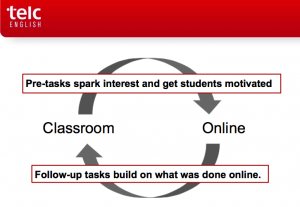 Instead of ending our lesson with the instruction to go online and do task X for homework, we need to take the process full circle. To do this we can add a pre-task to spark interest and motivation and then follow-up tasks to build on what was done online. This shows students that online homework is not just ‘busy work’ but essential to progress. If they don’t complete the tasks, they are at a disadvantage in the face to face lesson. You might think this is obvious, but because online learning materials are created for self-study, giving immediate feedback, we tend to think ‘they did the task, we can move on’. But then we miss out on an opportunity to really knit the course together. 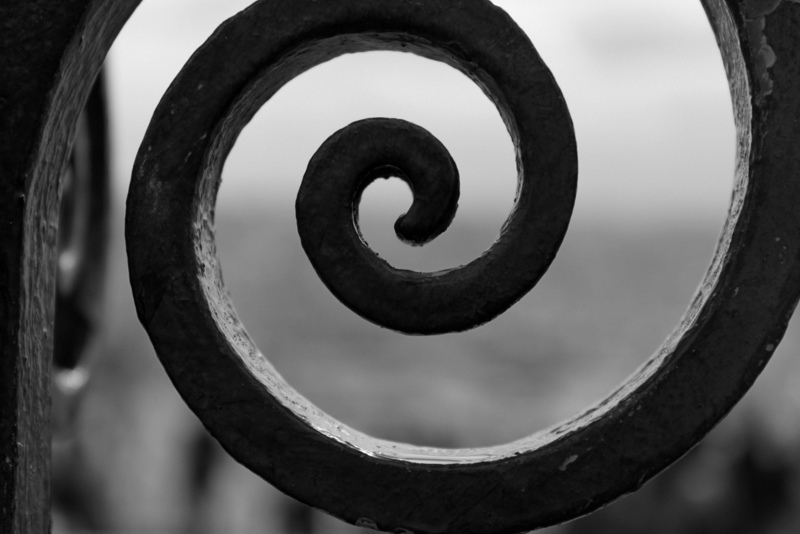 We want to make sure that students see it as one course, rather than two parallel streams that are loosely linked, with the second stream being less important, or possibly optional. We could take the online material and check comprehension or vocabulary, ask for opinions or predictions, but these are things we already do. The CEFR, with its action-oriented, communicative approach, can help us come up with creative tasks that are communicative, personalised and appropriate. In the workshop, we looked at modules from telc’s English Practice Material Online B1-B2. Here is what we did with a module from the unit Gratitude, involving a radio show where listeners rang in and spoke about the people who made a difference to their lives. To create some follow-up tasks, we first used the descriptors for Correspondence. B2 Can write letters conveying degrees of emotion and highlighting the personal significance of events and experiences and commenting on the correspondent’s news and views. B1 Can write personal letters giving news and expressing thoughts about abstract or cultural topics such as music, films. Can write personal letters describing experiences, feelings and events in some detail. Who would you like to say a special thanks to? Why? Take a minute to think about your answer, then tell your partner. 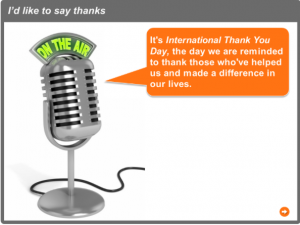 Write an email to a special person for International Thank You Day. Explain why you want to thank them. You can write about some experiences you’ve shared, where you both first met, or how you felt when they helped you out or supported you. I have highlighted the words that link directly back to the CEFR descriptor, to show that the task really focuses on what the CEFR says students at those levels should be doing. What can you do with the finished emails? Note the descriptor for B2 mentions commenting on the correspondent’s news and views. B2 students could be given a new email at random, and asked to read and respond in character. Other ideas participants came up with included composing letters to thank specific people, designing thank you cards for family and friends, writing facebook posts and even a song about gratitude. But to be honest, that one was kind of easy, so I decided to try something more challenging. I asked the participants to match the topic of gratitude to two other descriptors that were not as obvious as perhaps correspondence was. B2 Can give clear, detailed descriptions on a wide range of subjects related to his field of interest. 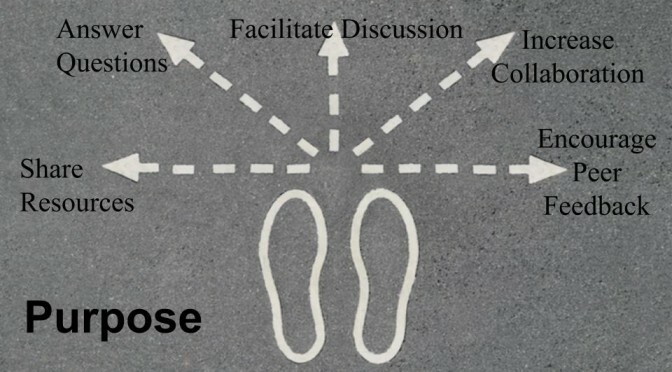 B2 Can take an active part in informal discussion… commenting, putting point of view clearly, evaluating alternative proposals and making and responding to hypotheses. B1 Can reasonably fluently relate a straightforward narrative or description as a linear sequence of points. Can give detailed accounts of experiences, describing feelings and reactions. B1 Can make his/her opinions and reactions understood as regards solutions to problems or practical questions of where to go, what to do, how to organise an event (e.g. 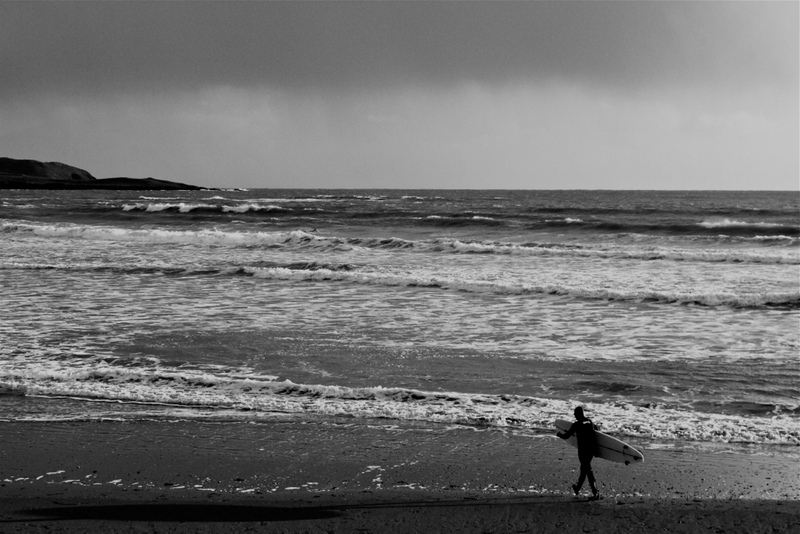 an outing). For Sustained Monologue, I suggested a task based on a speech at your best friend’s wedding or birthday party and for Informal Discussion, a task that focuses on planning a surprise party for your best friend. Other ideas for Sustained Monologue from the participants included having students create their own radio show talking about people who were special to them at different points in their lives, giving a thank you speech at an award ceremony, and presenting a Pecha Kucha on the topic of gratitude. For Informal Discussion, the radio show idea again, but this time as a dialogue or interview, a discussion about who to award a prize to, or which song expressing gratitude you would choose as you theme tune. Other ideas were informal discussions to decide on the best birthday gift for a mutual friend, or to plan a day out for a friend who’s feeling a bit down. I was delighted by the participants’ enthusiasm. Their suggestions were really creative and would definitely make exciting communicative lessons. We looked at other modules and came up with lots of great ideas and hopefully I achieved my goal of sharing my love of the CEFR. Not only can it help students assess their abilities, it can also be used by teachers as a tool for planning a course, creating lessons and as in the case here, designing communicative tasks to use with online materials. Look at the descriptors with students in class to identify some key areas students wish to work on. Use those descriptors when planning your lessons. Assign descriptor/s at random to each of the units in your coursebook. Try to integrate these descriptors when planning. 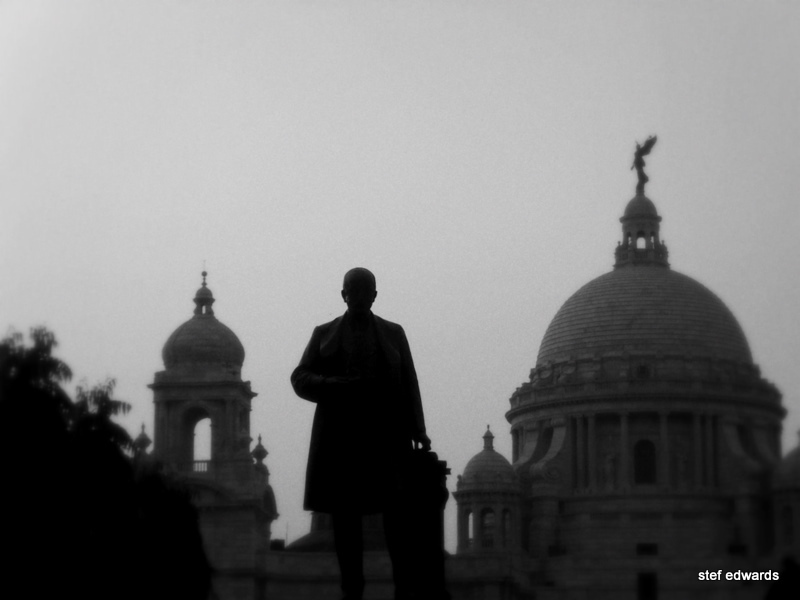 Find interesting content online. Use the CEFR descriptors to design action-oriented tasks to link the online material to classroom learning. Online tutorials are a weekly fixture on the distance learning MA I’m currently doing. Contrary to my expectations, these are not carried out in a video conferencing setting to replicate a face-to-face environment. 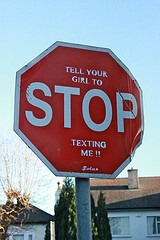 Instead, a synchronous chat tool is used. Students and tutor are online at the same time, in a ‘meeting room’ where they discuss a topic by typing out their comments to each other. My initial feelings towards chat were very mixed. The approach is very student-centred and I was at times frustrated by the slow pace of discussion and the tendency of the participants to go, as I felt, off topic. I enjoyed the interaction and felt it was a nice way of getting to know classmates, but was sceptical about how beneficial it would be for me from a learning standpoint. Within a few sessions, I’d completely changed my mind. Two factors I found particularly impressive were increased participation and inclusion. Because communication is being carried out via text, participants don’t have to wait for their turn to respond. So there’s no real limit to the number of comments they can make within the hour-long tutorial. As more people are commenting simultaneously, participation is higher than it would be in face-to-face tutorials. Many students mentioned that they feel more confident making a written contribution to the discussion, as they have time to formulate their comments and reflect on grammar and vocabulary choice. As a result, chat tutorials are more inclusive than tutorials where spoken communication is required. This was really something I had never thought about and it encouraged me to assess how I facilitate communication in my own classes, with the realisation that, be it through the context I work in or an unconscious bias based on learning styles or preferences, oral communication is prioritised over written communication. So my new goal is to try to introduce text-based communication to some of my lessons to see if it could help increase participation and ensure all students have a voice. Of course from using chat weekly, I see that there are some disadvantages. Due to the fast pace of participation, there are often spelling and grammar mistakes, from native-speakers as well as non-native speakers. As many people are communicating simultaneously without the presence of turn-taking conventions typical in face to face communication, the discussion can be hard to follow. This means the tutorial scripts can be confusing, particularly to those who didn’t take part. However, I think that errors in syntax and spelling, and confusion arising from comment overlap can become valuable learning opportunities, especially as students are analysing their own mistakes. So this main disadvantage is actually a benefit in a language learning context. After some research, I have found the site TodaysMeet.com a free site that allows you create ‘rooms’ for chat comments and discussions. So far I’ve used it with a group of six B2-C1 business students in an advertising agency, as a backchannel for comments and questions while we watched a TED talk (I paused at regular intervals to allow them to read and comment on what the others had written). I intend to do more experimenting with this tool now that I have realised the benefits chat can have and plan to write up some lesson ideas soon. In the meantime, if anyone tries or has tried this out, please let me know how you got on. I’m busy being a student again and now half way through the first year of an MA in Technology and Education with the University of Leeds. As part of the module ‘Learning with Digital Technologies’ MA, I had to reflect on my experiences with different tools and learning theories. So I thought I’d share my thoughts on the flashcard tool Quizlet. 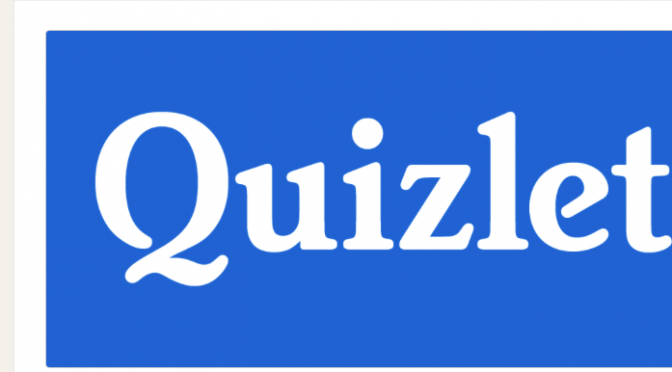 Quizlet allows you to create flashcards, games and quizzes which can be used to learn vocabulary, definitions, historic dates and so on. Progress is assessed automatically, giving students feedback as they make their way through the activities. After logging in for the first time, I typed ‘English’ in the search function and found numerous flashcard sets, created and shared by users. Many consisted of image and word combinations suitable for lower ability levels. Others sets such as ‘Junior College English Vocab’ contained words like nebulous, fetters and truculent, which would be too advanced for most ESL (English as a Second Language) students. Many sets were simply titled English and, although hovering over the title presents a view of the contents, it was often unclear what the connection between the words was. Without proper naming or tagging conventions to clearly identify the target group and type of the vocab, finding suitable sets to practice with is time-consuming and I feel this reduces the value of the set sharing function. However, when I started practicing with a flashcard set I found the tool to be very engaging and was impressed by clever additions such as the option to listen to the words, the choice of displaying either the term or the definition first and also the fact that tests can be printed. The games are timed and once your score is revealed, you are encouraged to repeat the activity to beat your time and improve your position on the score board. Motivating messages, such as ‘Yipee, you beat your previous record’, are also given. Having assessed Quizlet from a learner’s standpoint, I followed the steps to create a set of flashcards on English financial terms with definitions. This was very easy and, as the tool gives you the option of importing your own lists, very quick. Quizlet does not ‘teach’ the user, being limited to simple repetition of words to help memorise spelling and meaning. However, I feel the key to its appeal is the individualisation aspect, as students can choose the type of activity they want to try and can repeat it as many times as they want, therefore defining the pace of the progress. I had heard of Quizlet prior to this, but had assumed it would not be suitable for advanced-level adult learners. 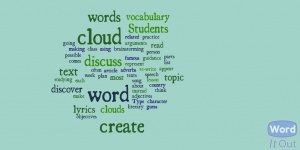 I worried they would see it as game-like or frivolous, and I also felt that prescribing lists of words for students to learn goes against the type of student-centred learning I try to practice. Having to try out different tools as part of the MA course has made me aware of the need to reflect on my own bias or preference regarding learning strategies, and now having tried Quizlet, I feel that, ironically, the tool I dismissed as being too teacher-centred could have great potential in a constructivist classroom. Allowing students to choose the vocabulary and definitions they want to practice or encouraging them to create sets themselves, which they could then share with classmates, would give them a central role in the learning process. As Business English teachers, travelling from company to company, we usually have to make do with the equipment available to us. In some cases, that might not even include a whiteboard or flip chart. If, however, you are lucky enough to have an interactive whiteboard, or even just a projector to hook your laptop up to, you’re ready to make that move from course books and handouts to a more creative ‘connected classroom’. The range of websites and apps out there is staggering. You can produce everything from podcasts and word clouds to infographics and videos, but what then? You need some way of bringing it all together, a place to save and share your students’ finished work. 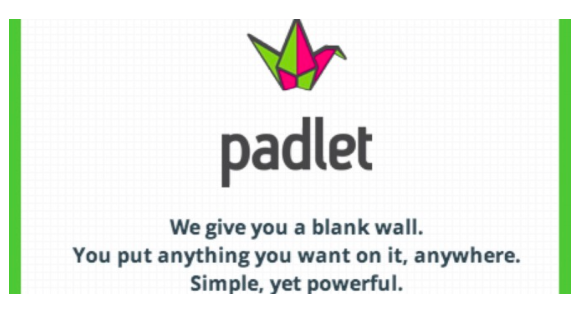 For this, Padlet.com is ideal. 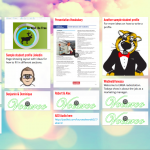 Padlet lets you create a digital wall, similar to a noticeboard or pin board. You can post content for your students, adding documents, videos and links related to a topic being covered in class or you can create a wall for collaboration and allow students post their work, comments, questions there. I love it because it’s easy to use and because students do not need to sign up to access walls. 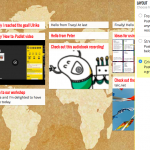 You can have multiple padlet walls, one for each group or project. You can customise your wall, make it public or private, pick an address or url for each one and share the link easily. You can choose to be notified when students post something, which is handy if you want to give feedback on homework. I could go on and on. Share content with your students. Have a wall dedicated to each different group. Add anything you see that might be of interest to them, related to their business or the topic being covered in class. This can be used for homework or as a source of further reading for when they have some extra time on their hands and fancy some English practice. 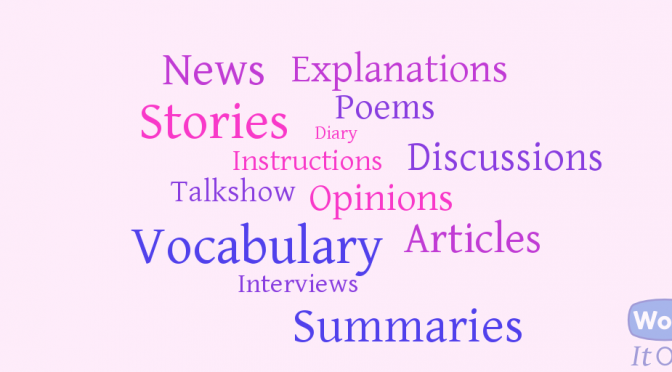 Create walls for specific topics. I have walls for things like presentation skills or CV preparation. Students and teacher add relevant content. 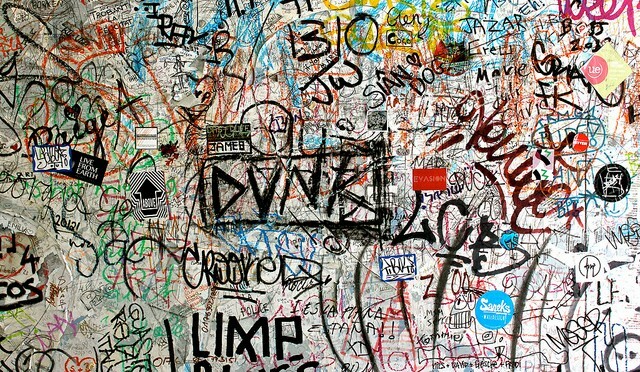 These walls could potentially be reused again and again. Students create their own walls and use them as a digital portfolio. They save their finished work there. It’s a great way of charting their development and at the end of the course, they can present a selection of their work. Use a wall for team work and brainstorming. The free flow layout allows you to move posted ideas around to categorise them as good, ok or impractical. Have a wall for each course book or course book unit – students add new vocabulary, links to extra grammar practice, additional texts relating to the unit’s content. Display – photos of art projects, finished essays (stream mode works well for this also). Discussion (stream mode). Post a statement and students give opinions and comment on the opinions of their classmates. Students can each create a wall and use it as a learning diary, a language notebook, or a resource scrapbook. Save links to websites, notes on grammar, vocab lists, inspiring quotes. As walls have no limit to their size, this makes them a great bookmarking tool. Use a wall for introductions at the start of a course. Students can share information about themselves, photos, even post an audio greeting. You could also collectively create a list of everyone’s contact details, so if someone misses class, they have the chance to get in touch with fellow-classmates to find out what they missed. Go check it out! I’m sure you’ll love it as much as I do. 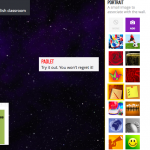 More images of padlet walls for inspiration! More images of walls for inspiration. How to: Facebook groups for EFL/EAP. As a follow-up to yesterday’s post on EAP 2014 at the University of Potsdam and my Facebook groups for EAP presentation, here are 2 videos to give details of how to actually go about setting it all up. This first tutorial outlines the steps you take to create a Facebook group to use with your English students. 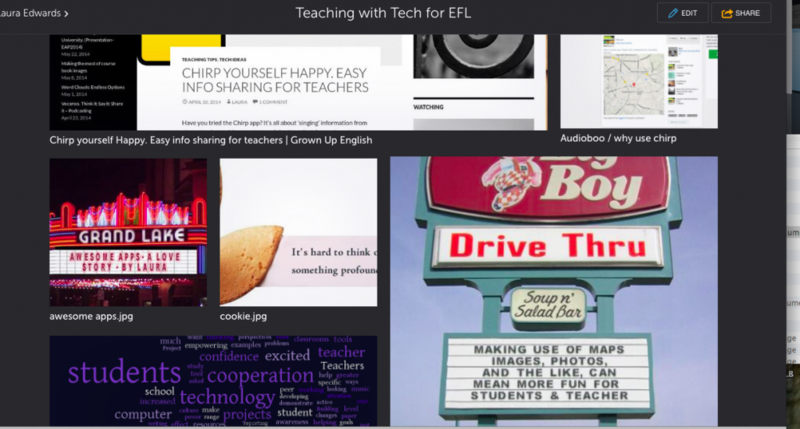 The focus is on creating a space for sharing and collaborating, while encouraging students to use English outside of the classroom using a tool that they are familiar with. All this is possible without teachers or students needing to ‘friend’ anyone. This second tutorial gives you some quick ideas for getting started. You can post pictures, questions and tasks, create polls or add a document.